The Thick-billed Parrots (Rhynchopsitta pachyrhyncha) is one of only two species native to the United States - the other being the now extinct Carolina Conure. The Thick Billed Parrot's range stretches from Mexico, north into Arizona and New Mexico. Due to habitat destruction, predation and hunting, this species is now only found south in Mexico. However, efforts are being made to reintroduce this species back into the United States. This is a protected species that occurs naturally in the highlands of Northern and Central Mexico. The Thick-billed Parrot lives in temperate conifer, pine, mature pine-oak and fir forests from 1200 to 3600 meters. For the most part, it is restricted to the Sierra Madre Occidental of Mexico, though it used to live in the southwestern United States. Birds had been reintroduced in Arizona in the early 1980's, but this effort turned out to be unsuccessful. The parrots could not adapt to avoiding natural predators. Due to habitat destruction and illegal bird trading the Thick-billed Parrot is endangered in its natural habitat - it is listed on the IUCN Red List of Threatened Species and on Appendix I of CITES. It is estimated that only 1,000-4,000 Thick-billed Parrot exist. However, this parrot is well-established in captive breeding programs in many zoos across the world. This medium-sized parrot averages 38 to 40 cm (15.2 - 16 inches) in length. 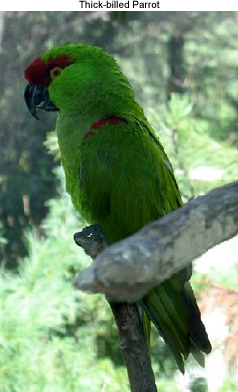 It is a bright green parrot with a large black bill and a red forecrown, shoulder and thighs. Adult eyes are amber, while juveniles have brown eyes. The rest of the bird is bright green. The bird is stunning in flight. Thick-billed Parrots show red shoulders and leading edge on the underwing, followed by a blackish green stripe, then a yellow stripe, followed by the remaining underwing showing dark green. It appears to show a blackish tail. The bird sounds like a high pitched macaw and make a variety of harsh, rolling calls. These parrots like to nest in tree cavities, especially old woodpecker holes. The average clutch consists of 1 to 2 eggs which are incubated for 24 to 28. It principally feeds on seed from various pine species, so much so their entire lives revolve around cone production. Flocks of these parrots roost by cliffs and they breed at the peak of pine seed production. It is nomadic, following the variations of cone abundance.